Morning glories are generally twining vines with heart-shaped leaves and tubular corollas. The most common corolla colors are shades of purple, but white and red-flowered morning glories also are common. Morning glories are generally considered members of the genus Ipomoea, but this is not a monophyletic group. Therefore, we focus our investigations on spiny-pollen morning glories of the tribe Ipomoeeae, which includes Ipomoea (500 – 650 species), as well as Argyreia (90 spp. ), Turbina (15 spp.) Astripomoea (12 spp. ), Stictocardia (12 spp. ), Lepistemon (10 spp. ), Rivea (4 spp. ), Blinkworthia (2 spp. ), Lepistemonopsis (1 spp. ), Paralepistemon (1 spp). The morphological features of these flowering plants are evolutionarily labile. Therefore, we obtain molecular systematic data to understand evolutionary relationships. We are excited to have developed a well-resolved phylogeny for the major groups of morning glories using whole chloroplast genome sequences for 29 species. This provides a scaffold for further research on the systematics of this diverse group of flowering plants. We currently are developing a multi-gene phylogeny for morning glories. 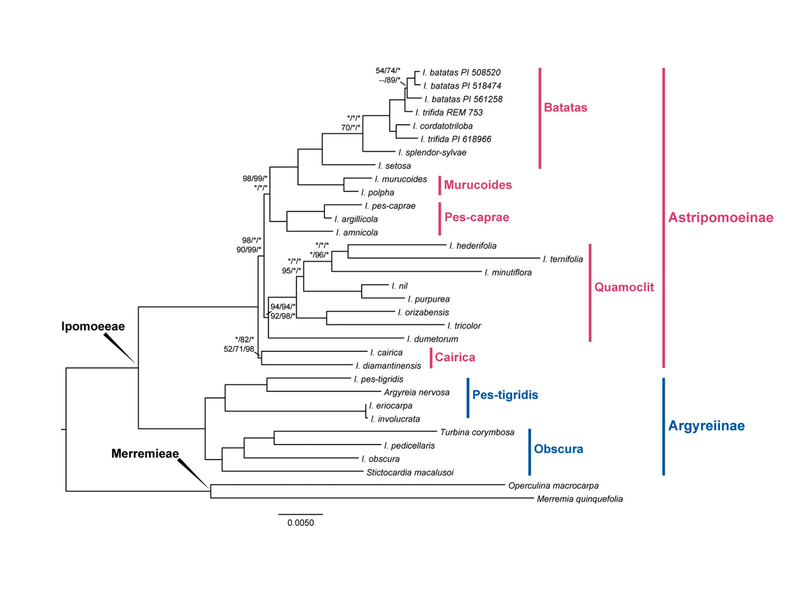 In doing this, we are very interested in gene tree and species tree incongruence. In particular, we address phylogenetic signal versus phylogenetic noise among different gene trees, a result we hope will inform investigations that involve large multi-gene datasets. We also are tackling some closely-related groups of morning glories combining molecular methods with morphology-based taxonomic research. The Pharbitis group and the Batatas group are the subjects of these investigations.